Ok, so the title of this post is a little deceiving. I doubt Patrick Kane could be a great baseball hitter, but he (and almost all professional hockey players) use “slapshot” mechanics that are very similar to effective baseball/softball “swing” mechanics. 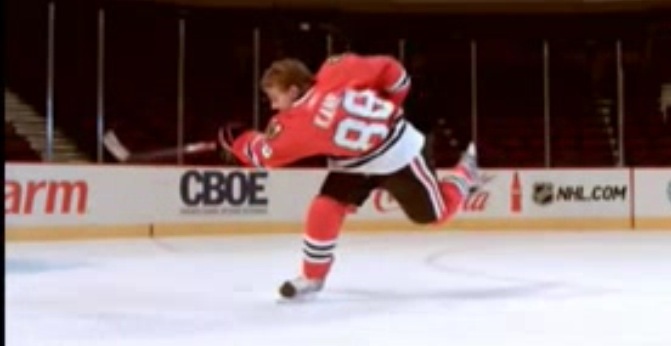 Here is a video of Patrick Kane’s slapshot in slow-motion. As you can see, he uses all of his relatively small frame to generate crazy “stick speed”. It all begins with Patrick moving his hands and stick back and away from his body, as far as he can. If you read my previous post (The Calm Before The Lightning), this should be a familiar concept. Patrick’s slapshot motion begins as he captures the power from the ground (ice), by pushing off with his rear skate and leg (the load). He then simultaneously rotates his upper body violently from the power generated from his lower body to propel his stick on a direct path into the puck. At the moment of impact with the puck, Patrick’s arms are fully extended to create “lightning on ice”. Like great hitters, he maintains this extension (and stick speed) as long as possible. He then transfers his weight from his back skate to his front skate to finish the shot with all the power he has in his body. Finally, he allows his stick to travel on a path that will not impede the stick speed he generated from the ice and the kinetic linkage from his body. If I changed some of the words in the previous paragraph, it would be an accurate description of the baseball and softball hitting mechanics I teach. I could have made a few more comparisons between a professional slapshot and a great baseball/softball swing, but you get the idea. Patrick Kane’s shot is not only beautiful to watch, it is powerful and repeatable. Baseball and softball hitters who use similar mechanics will enjoy the same power and consistency. Oh, by the way. Why is it that almost all professional and amateur hockey players have slapshots that look almost identical? Why doesn’t every hockey player on the 2013 World Champion Chicago Blackhawks have different slapshot mechanics like major league baseball players who all look different at the plate? Maybe, there is some validity to the arguments I made in my last post that “one size should fit all”, when it comes to the baseball/softball swing. Hmmmmm….